Olives ripen in hot and dry areas and are naturally exposed to a high amount of sunlight. Just as the human skin, the olive skin can develop irreversible damage by UV-rays ; therefore it needs a defense to prevent from structural injury. The olive forms an important protecting factor: Hydroxytyrosol. Roberto Crea, scientist and founder of the company CreAgri® has been studying the effectiveness of hydroxytyrosol for many years, in cooperation with international research teams. He substantiated and documented this outstandingly with a great variety of studies and publications. His company in Hayworth, California, produces a hydroxytyrosol product made from olive water. Due to a unique manufacturing process, the essential ingredients remain intact in its natural matrix. 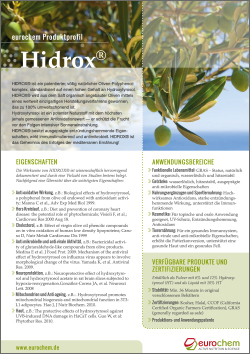 We exclusively sell this product in Europe under the name of HIDROX®. Since 1999 CreAgri® has obtained 6 US patents and 13 international patents for the manufacturing process, composition and applications, which build the foundation of a comprehensive scientific portfolio. It was not until 2015 that the European patent office issued the patent for the use for severe skin diseases. The most relevant studies researched the impact of HIDROX® on the cardiovascular system, cholesterol, bacteria, viruses (Influenza), cell aging, nerves, UVB-damaged skin, atopic eczema, and psoriasis. The research continues: Currently, the cell-protecting properties of HIDROX® on neuronal cell damage, typical for Alzheimer’s disease and Parkinson’s, are being investigated. Results are expected to be positive.. In the meantime, HIDROX® can definitely be used in functional foods (GRAS-status), sports nutrition, food supplement and cosmetics (helps to contain microbial growth and fat oxidation)! Please contact us for further information, specifications, and samples!